Do you ever say to yourself “If only I had bought it when…” or perhaps “I knew I should have sold it…”? We are all aware of the saying “Buy low, sell high” but how can any one of us predict what the future holds? If there was such a thing then we would all be rich. There would be no losers. Alas, we are all human, we can’t predict the future. We are prone to emotional investing where we follow where the money goes. A lot of people try to “buy high” and “sell higher”; chasing dreams of quick riches and getting out before the last sucker gets in. People try to time the market and anticipate what happens, but no one is perfect and at the end of it all, we tend to lose money and throw away any gains that we make through increased commission fees. I don’t have a crystal ball, if you ask me when you should buy or sell I would not know how to answer that, nor would any other financial advisor. If someone says they can, ask them to show you their Delorean, maybe Michael J. Fox came back in time, but I will bet that they are making guesses by throwing darts at a wall. So is it impossible to predict the future? Probably. So must we hold our investments forever and not know when to sell? Not necessarily so. We solve this dilemma by incorporating the strategy of balancing. When you set out to create an investment portfolio, one of the key ideas is to balance your money across many investment assets. Real estate, stocks and bonds are all very good investment vehicles to help grow your money. 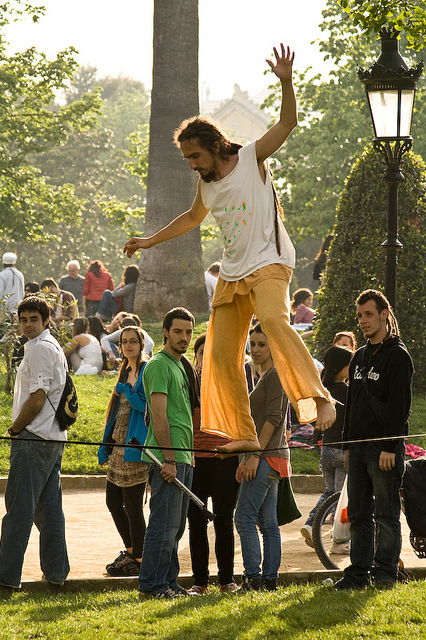 Balancing ensures that you don’t get caught up in the volatility of one specific investment class. Whether it’s a stock market crash or a housing correction, diversifying across many investment classes helps damper these negative effects. Balancing your portfolio on a regular basis is also a way of passively implementing the practice of “buying low and selling high”. When you start building your portfolio, set goals and percentages that you want to maintain in your investment portfolio. The percentage of each investment type will vary between person to person, it’s based on your risk tolerance and what your own personal financial goals are. Once you settle on what you want to buy and how much you want to buy, you stick to those goals. That’s the key to balancing your portfolio. The interactive version of this chart can be found at Stingy Investor. The chart shows that not one single investment type was the best investment for every single year. In fact, if you cycle through the last 30 years, a wide range of investment types would have been the best performer for the year. Sometimes, the best performer for one year would become the worst for the next. As an investor how do we know? How can we plan for such an event? We don’t know, we don’t plan, we just continue to balance our portfolio. Just like how a balanced, nutritional diet is necessary to maintain your own personal health, an investment portfolio demands the same treatment. Still not convinced? Let’s look at an example. In this example we start off with $50 000 to invest across 4 different types of assets. 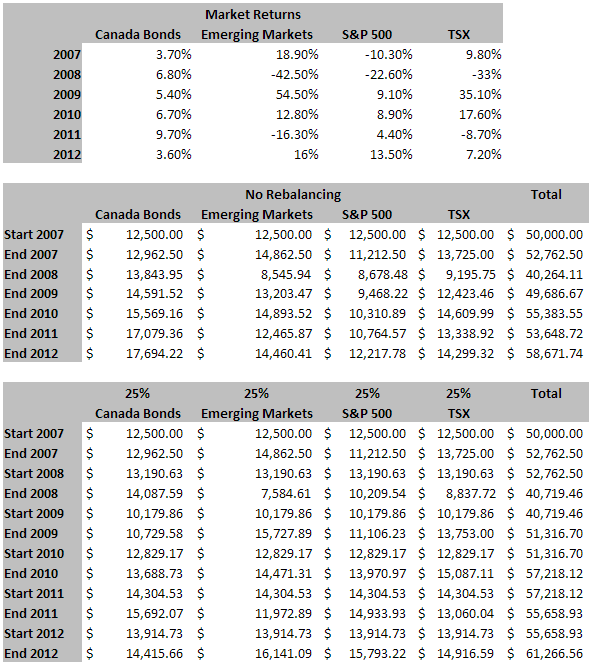 $12 500 is equally distributed among Canada Bonds, an Emerging Markets fund, a S&P 500 fund and a TSX fund. Using historical returns from 2007 to 2012, I charted the value of the portfolio if one had not rebalanced the portfolio versus a portfolio that was rebalanced at the beginning of the year. Each asset class in the balanced portfolio had 25% of all the money divided evenly at the beginning of each year. This was done regardless of how the performance of the asset did the year before. If you review the chart, there are startling conclusions that can be made from rebalancing a portfolio. First off, the total value of the balanced portfolio at the end of 2012 is almost $4000 more than the portfolio that was never rebalanced. The more interesting fact of a rebalanced portfolio is how much faster it recovered from the stock market crash of 2008. After only 1 year, the portfolio had recovered beyond what the original investment capital had been, whereas the other portfolio did not get back to it’s original amount until after 2009. What conclusion does this give us? Rebalancing your portfolio for one mitigates risk. It also passively promotes buying low and selling high at the same time. When one asset class goes up a lot and makes your portfolio unbalanced it means that it is time to sell some of that and buy the other asset class that is doing poorly. When you rebalance you are also spreading your money across many different types of investments. This also lessens the risk of having all your money in one investment. So when do you rebalance? You can set a certain time of the year to rebalance, like the start of the year or the middle of the year. A better way to rebalance is to do it when the percentages in your portfolio start straying wildly from your set goals. So if you want to keep your TSX portion at 25%, and during a particular year it does really well and gets to 30%, then it might be time to sell some of that and rebalance your portfolio. This keeps your ratios intact and also keeps your portfolio at your desired risk level. The strategy of rebalancing works best when you have a large sum of money to invest and you want to do a limited number of trades. With this strategy, you can use ETFs to lower your MERs and trade infrequently enough that trading commission fees do not hinder the growth of your portfolio. Remember, ETFs have a lower MER and with large sums of money the MER from mutual funds really starts taking more away from your portfolio than costs associated from rebalancing your portfolio. So does this mean someone that is investing month to month with mutual funds should avoid balancing? Certainly not. Even if you are doing dollar cost averaging with small sums of money through mutual funds, you should review your portfolio at year’s end and think about rebalancing your funds so that it better reflects your goals. In life everything needs balance. Work and play. Greed and benevolence. Light and darkness. Apply the same to your investments.